Buttonholed Herringbone is a composite stitch which I often get asked about. As the name suggests it consists of a foundation of herringbone stitch which is then buttonholed. First work a line of herringbone in fairly solid thread such as perle 5. If you need a refresher on how to work herringbone follow the link to see a tutorial. You will also find buttonhole as well. Use a blunt ended needle for the second thread so that you do not split the foundation herringbone stitches. Bring your needle out at the base of the row of herringbone then work buttonhole stitch using the herringbone stitches as the foundation. Note you are not passing your needle through the fabric. Work buttonhole stitches along the bar until they are snug. When you reach the top of the bar pass the needle under the cross of the herringbone stitch and work a single buttonhole stitch. Then continue on the downward bar once again working enough buttonhole stitches until they are snug. When you reach the bottom of the bar pass the needle under the cross of the herringbone stitch and work a single buttonhole stitch. Continue in this manner until the foundation stitches of herringbone are covered in buttonhole. That was my last stitch! I was able to complete all of TAST in 2018! Thank you so very much Sharon. I am ever grateful for your site and putting this challenge together. I will turn my pennants into bunting and send you the final link when I get that accomplished. I’ll let my embroidery guild use it when we host tables at events as well. My schedule is changing a bit for 2019, but I will certainly play along when I can. Happy New Year! I am a little behind everyone else. Here is my sample of Stitch 55, buttonholed herringbone. Another side of my textile vase finished. This is a compilation of the tast stitches – the last being Buttonholed Herringbone. Hi,Sharon,here is my sample. http://needlwork.blogspot.com/2013/03/tast55.html Thank you. 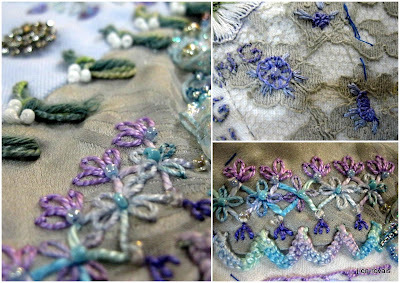 I decided to pick up my TAST-ing again, so here are a few ‘old’ stitches I finished this week. Thanks and have a nice sunday. This was the perfect stitch for my armadillo’s ears. Slowly, week by week, he is taking shape. I’ve got his head done now. here is my participation for the tast. I tested the second stitch of the previous week, and I’ll try to catch up the last week. Here is my sample for the last two week’s stitches. I’m still doing the buttonholed herringbone but I have just posted my design challenge 1 on my blog. Carol probably your foundation stitches are too tight. Let the tension on them ease a bit then when you buttonhole them they become loops. I’m planning to write my weekly post with old stitches tomorrow, I have some nice samples of the buttonholed herringbone stitch.